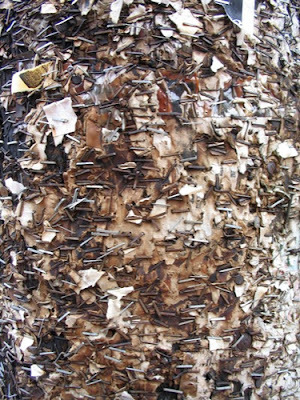 My friend, the artist Ryan Griffis, took this photograph of a telephone pole covered with staples and bits of paper from fliers, posters, and remnants of announcements past. With it, I am trying to capture the essence of community informatics–a phrase that brings a puzzled look to many a face. This is an image of messy vitality, of conviviality. Imagine the meetings, the missing pets, the items for sale, and the interconnections that all these staples represent. This image probably does not “sell” community informatics adequately, but perhaps it will prompt others to choose their own depiction. What follows is a list of phrases that I came up with in an effort to get at some key concepts of CI.